We’ve thundered into the 21st century at The Hibs Club – and your business could benefit. We’re making the most of our new TV screens (including five 65 inch screens in Whelahans bar) to promote our shows and events. But we’ve still got space. For a very reasonable fee you can promote your business to our members and visitors. We can provide graphics or you can provide your own. We’ll also make sure you get mentioned on our website and social media channels. That includes over 8500 Facebook followers and a potential audience of over 1000 people in The Hibs Club each weekend. Whatever your business, it makes sense to do business with The Hibs Club. We’re delighted that Three Doves Entertainment are our first Hibs Club advertising partners. 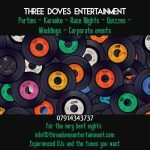 Your first stop for the perfect night – Three Doves offer parties, karaoke, race nights, quiz nights, weddings and corporate events. 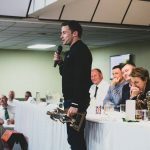 Firm favourites of members and guests at The Hibs Club, Three Doves are now connecting with an even bigger customer base as Hibs Club advertising partners.